The 1950’s were very important for Scottish men’s athletics but even more so for the women’s side of the sport. There were no international fixtures over the country, the SWAAA Championships were only for senior women and track races above 220 yards were few and far between with most of those being handicap races. By the end of the decade the championships had swelled to include events for Juniors (under 15) and Intermediates (under 17) as well as for senior women and the number of events had almost doubled. This was largely down to the women themselves demanding races and supporting those that were put on. It was a hard job getting the number of 880 yards races increased and even harder to get the Mile into the District Trials, Inter District and Championship fixtures – there were none at the start of the decade. As in all endurance running for women, Dale Greig was a key figure but there were other notables who should be discussed and remembered. Unfortunately the records were not kept as well as for the men and the reports in the newspapers were fewer and scantier for the women too. We seriously need information about these pioneers. Barbara, now living in Autralia, was kind enough to complete the questionnaire for us. Occupation: Teacher, Relaxation Therapist, Author, (Published 3 books, 3 health and fitness Videos Relaxation Tapes) Public Speaking engagements. How did get into the sport initially? I knew I could run when I was at primary school. My teacher always made me run in the races against the boys not the girls. I then went to James Clark High School in Edinburgh and in my second year I was sports champion for the school. I knew then I loved to run. My Uncle David introduced me to the Edinburgh Harriers Athletic Club. In my first year I was very shy and only did the short distances the same as the other girls. At the East via West the next year 1956 the east team needed someone to run the half mile in the relay, so I put my hand up. I ran a good time and loved the longer distance. From there I entered the quarter mile and the 1 mile in the Scottish Championships in the June. I really liked the quarter mile and so wanted to beat Anna Herman the mile was just another race to try. On the day the mile came first and I broke the record so quarter mile did not seem so important. Personal bests. In 1959 I broke my own mile record three times in that year brining it down to 5 minutes 18.3 sec and then in London British Championships I came 4th in a time of 5 minutes 15.4 seconds. In 1960 at Bute Highland games I clocked a time of 5 minutes 12.5 sec. I was going well in training and my time was getting better. I was once again training with the boys, and on one very special day at Meadowbank I got my training time clocked at 4minutes 59.3sec. I was feeling so good and looking forward to the next season. But things did not go as planned I did not feel very well during the winter and the doctors found I had T.B. in my lungs. I was divested I was told I must stop all training immediately. I felt well so I kept on training. The doctors said my good feeling would not last and my body would soon start to break down, and it did. In my last Scottish championship race at Meadowbank on 10th May 1961 I came 3rd that day I knew I could not go on. My leg was very heavily strapped I could hardly move my left arm both cartilages in my knees had been damaged. I knew then I would have to stop my beloved sport. Did any individual or group have any marked effect on performance or attitude to the sport? My Uncle David was the person who encouraged me most in my athletics. He had been interested in athletics in his youth. He was always there to encourage me in the good times and the bad. I was very young and shy and he gave me confidence to keep going. He was my rock. My idol was Dianne Leather. My coach was K Herman (Anna Herman’s husband) he was the most inspiring and dedicated person to the sport. He ran for Poland before the Second World War. He trained Anna and I hard and never took no for answer, or I can’t do. He made me a much better person in so many ways. When he found out I had T.B.and on longer able to run he introduced me to basketball. As he said a team sport would be easier on my health. I loved it. After some time and a lot of practice I was chosen to play for Scotland. I represented Scotland on many occasions the highlight was playing in the European Championships in France. Best ever performance as a runner? The best performance, well not the fastest time but the most memorable was the very first time I ran the mile at Meadowbank. It was a lovely day I had entered the 440y and the mile. The mile came first. I had no idea what I was doing as it was the very first time I had run the distance, the 440y was the race I was really interested in. As the race went no I just kept running with everyone and in the last lap the rest of the girls seemed to be a little out of breath and I still felt fine. Off I went running at my own pace it was such a good feeling. When I finished I was told I had a new Mile record knocking 6.7 seconds of the previous one. What a great day it was for me. I could not believe I had found the distance I liked running and I was good at it. I was a Scottish champion. What has athletics brought to me that I would not have wanted to miss? Friendships I made on my trips. The club spirit I will never forget. Being in a position where I can now encourage not just the young to never give up but also the elderly. Athletics gave me the courage to face up to difficult situations in life and I have had my share. To discipline myself in many ways to make me the person I am now. Life should not be a straight line; we have to experience the downs to appreciate the ups. I feel privileged to have been able to be part of women’s athletics at that time. Athletics what can I say it allowed me to have good friends, a positive attitude, help others, keeps me healthy as I get older, never give up, but most of all a lot of joy and happiness. What has been my involvement in the sport since I stopped running? I have had very little involvement in athletics since I came to Australia. It makes me too sad. My grandchildren aged 9 and 6 years play netball and they are both very good swimmers .I enjoy watching and encouraging them. I played netball in the same club as my daughter Wendi and Granddaughter Tanna till 2013 when once again I had to give up because of injury. I do keep up with athletics on TV and I go to the Olympic Stadium in Sydney whenever there is a competition on. Athletics is not a number one sport here. What changes would I make? I would like to see the girls being recognised in a similar way to the men! Where am I now? I left Scotland in 1980 after divorcing Archie Martin. I set up my business called Relaxacise. Not the easiest thing to do in a strange country. I did a segment on the Television show called Good morning Sydney. That lead to me recorded my videos and writing my books on the subject of Exercise with Relaxation. The programme became very popular which made it necessary for me to conduct teacher training courses. I married Bill in 1989; he is a very special man and encourages me in all my adventures. We live in Penrith just west of Sydney. I am still teaching classes and doing speaking engagements from time to time. I love living in Australia but still visit my home in Scotland whenever can. I like playing golf with Bill and training with the netball team to keep me fit. My new challenge is to encourage the older generation to keep moving in a natural way, and the young to keep trying and never give up. For those who wondered what she had been doing, the answers are all there. What a wonderful life she’s had in Australia. There were two key figures in the Mile in the late 1950’s/early 60’s. 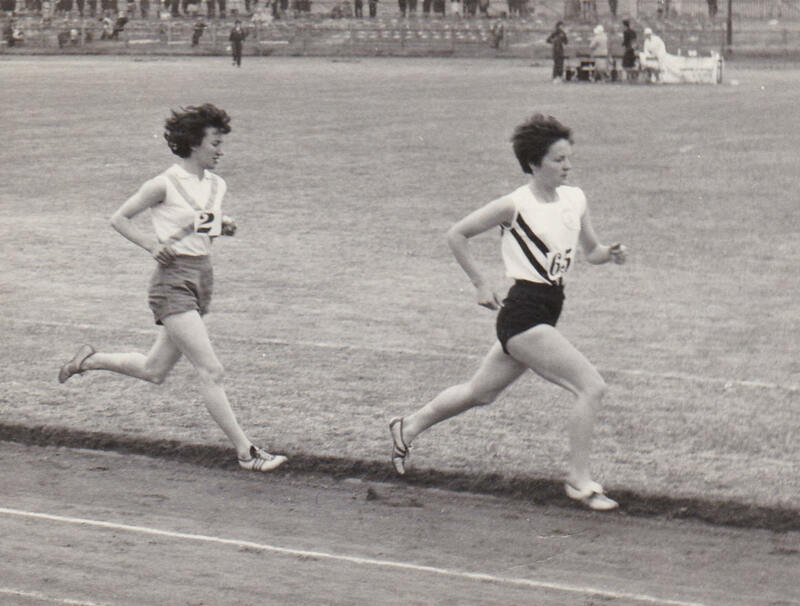 Barbara Tait and Helen Cherry between them won the SWAAA Mile title seven times in eight years before Georgena Buchanan came on the scene. Barbara herself won it five times in succession. 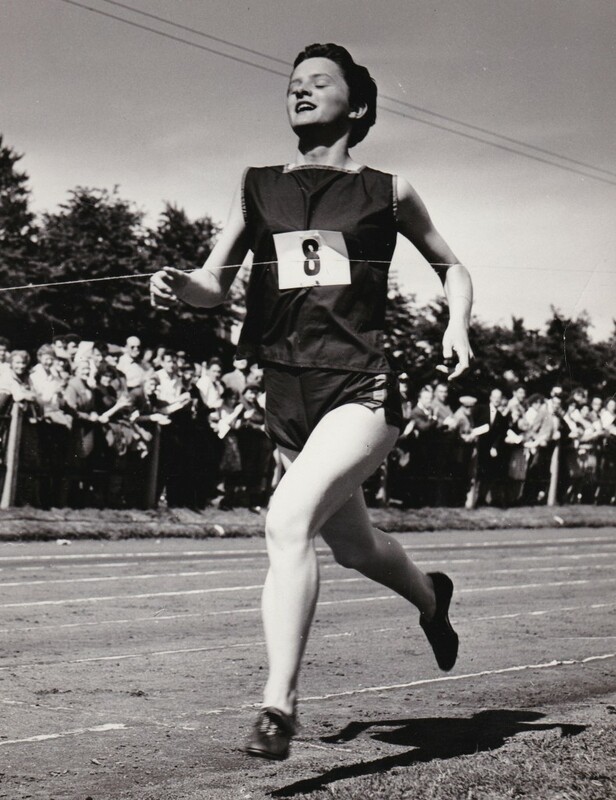 Doreen Fulton, a popular Springburn Harrier with a distinguished track pedigree and an established cross-country international, won it in the middle with her solitary win in 1961. Helen was second in 1959 and Barbara third in 1961 and 1962. It was a very different time from the twenty first century: running gear was nowhere near as light or functional, shoes were heavier with fixed spikes but most of all the tracks were different. Racing in championships was nearly always on cinder tracks which by the time the Mile races came along were very cut up by the previous events making it difficult for the runners. And yet the competition was no less intense nor were the rivalries any less exiting for the spectators. We can start Barbara’s profile with a look at 1956. Although not mentioned in the East District Championships or the East v West match, on 9th June 1956 Barbara won the SWAAA Mile in 5:28.3 which the ‘Glasgow Herald’ said beat the existing record for the distance by 7 seconds. The actual report on the race in the pink ‘Evening Times’ read as follows: “Seventeen year old Barbara Tait of Edinburgh Harriers became the new mile champion. Her victory over A Lusk, the holder, was a popular one. The former James Clark’s schoolgirl was “swamped” by her jubilant friends at the finish. There was even more applause when Barbara’s time of 5 min 28.3 sec was announced as it was a new Scottish native record by nearly seven seconds.” ‘The Bulletin’ read, Barbara Tait has set a new record. A brilliant mile by 17 year old Barbara Tait of Edinburgh Harriers in which she set up a new Scottish native record of 5 min 284 sec was an outstanding feature of the Scottish women’s athletic championships in Edinburgh yesterday. Barbara, a former pupil of James Clark’s school, ran a well-judged race and proved far too strong for the holder, A Lusk of Maryhill Harriers. At the finish the excited Barbara was overwhelmed by her enthusiastic friends.” She had also entered the 440 yards at the meeting but the Mile was her real event. 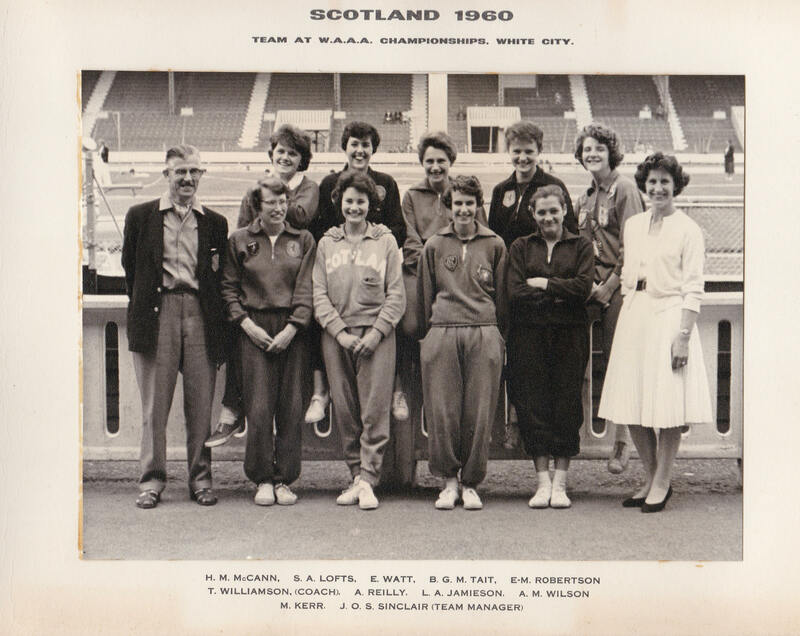 At the end of the season, on 18th August at Murrayfield in a scratch invitation 880 yards race, Barbara lined up against England’s Diane Leather and Ann Oliver, Poland’s Halina Gabor and fellow-Scots Molly Ferguson and Ann Reilly. Ferguson and Reilly were the SWAAA champions at 880 and 440 yards and in a race won by Leather in 2:18.5 Barbara was sixth across the finishing line. Barbara won the East v West match mile at Westerlands on 11th May, 1957, and then she repeated the SWAAA mile victory on 8th June when in a small but high quality field of herself, Doreen Fulton, Margaret O’Hare and Helen Cherry she recorded the time of 5:35. Helen Cherry, only 17 and an Intermediate sprinter the previous year, in her first run in the event was second and Doreen Fulton third. Barbara started 1958 with fifth place in the cross-country championships. In the summer season of Empire Games year, there were two seconds in the East v West match: in the Mile to Helen Cherry, and in the 880 yards To Molly Ferguson of Springburn. In the SWAAA championships, held early on 24th May, the hat-trick of national titles was achieved when she again beat the young Helen Cherry in 5:33.2 with Dale Greig third. Barbara had a most unhappy experience in the 1960 national cross-country championships, when …. The ‘Glasgow Herald’ says: Miss B Tait (Edinburgh Harriers) the holder of the Scottish Mile title, followed Miss Greig closely for the major part of the race, but she counted the laps wrongly, and put in her finishing burst – passing Miss Greig, a lap too soon. Attempts to persuade her to continue the race failed.” The race was won by Dale Greig from Pat McCluskey and Doreen Fulton. The track season started in much better fashion with a double at the West v East match on 21st May at Scotstoun. Winning the 880 yards from Molly Ferguson in 2:26.6, she proceeded to take the Mile as well in 5:24.2 from J Crocket of Aberdeen. In the SWAAA Championships held again at New Meadowbank, on 11th June Barbara won the Mile for the fifth consecutive year but the fact went unremarked in the ‘Glasgow Herald’. Barbara made her start to 1961 when she was fifth in the National cross-country championship at Greenock but missed the meeting against the English Counties in March. The track season began with a victory at Dam Park in Ayr, the occasion being the opening of the new pavilion. She won the 880 yards in 2:22.2. Unfortunately she missed the East District Championship a week later, the ‘Herald’ saying only that “Miss J Crocket (Aberdeen), in the absence of Miss B Tait, won the half-mile and the Mile.” For the record, the winning times were 2:43.8 and 5:54.6. Nor did she turn out in the East v West fixture on 22nd May but she did run in the SWAAA Championships where she finished third. The report only said, “Miss D Fulton (Springburn) caused a surprise when she beat Mrs A Reilly (Ardeer) on the post in the Mile.” Doreen Fulton’s win should not have been a surprise – she was a fixture in the cross-country international team with a whole series of top four or five finishes in the national championship along side many good track championship appearances and medals. However I would have thought that the winner of the title for the previous five years was third and was worthy of some sort of mention. But women’s athletics was not as well reported as the men’s. Nevertheless she still managed to top the national rankings for the Mile with a time of 5:22.0 and her 2:22.2 in the 880y ranked her sixth. Not mentioned in the cross-country championships of 1962, national or international, she won the Inter-District Mile from Dale Greig on 20th May. She did run however – ranked number three in Scotland for the Mile, with 5:26.4 for third in the SWAAA Championships behind Helen Cherry and Georgena Buchanan – but the trail seemed to peter out here. But then I heard from Neil Donachie in Edinburgh. He tells us that Barbara married a chap called Archie Martin and subsequently went to Australia where she had an exercise programme on TV. Barbara’s love of activity and the lifestyle that goes with it is clear from her whole career in Australia since she left Scotland : relaxation therapist, videos, books and sports activities such as netball right up to 2013.